Sanying has been recognized as a coveted manufacturer and supplier of a wide spectrum of Plastic Packaging Tubes. These tubes are manufactured using optimum quality plastic, aluminum and other material that are sourced from authentic vendors. Our remarkable range consists of Laminate Tubes, Cosmetic, Toothpaste, Collapsible Tubes, Ointment Tubes and Food Tubes. The products we offer are developed in accordance with industry norms and standards and are available in various colors, shapes and sizes. These tubes are extensively used in various industries such as cosmetics, pharmaceuticals and food products industry for packaging purposes. Barrier Property Contents remain well protected and free from contamination,sun,air,water,etc. ▶ PROTECTIVE: Contents remain well protected and free from contamination. ▶ ELEGANT: Attractive Possess a bright surface and lend themselves to trouble-free printing, this enhances shelf and customer appeal. ▶ NON-TOXIC & HYGIENIC: Non -Toxic, hygienic, non-absorbent, Impart no taste, flavour, odour or color to contents. ▶ LIGHTWEIGHT: Easy to handle. Reduces transport and handling cost. ▶ COMPLETE COLLAPSIBILITY: Highly ductile, ensures complete collapsibility. ▶ EASY AVAILABILITY: Aluminum Collapsible tubes are easily available. ▶ ECONOMICAL: Costs less than Tin or lead tubes. Needs no varnish. ▶ USER CONVENIENCE: Easy to use, unbreakable, easy to carry, light in weight, hygienic. ▶ Our clients of pharmaceutical tube is all over the world: Mentholatum, Wuhan Mayinglong, Mebo, etc. 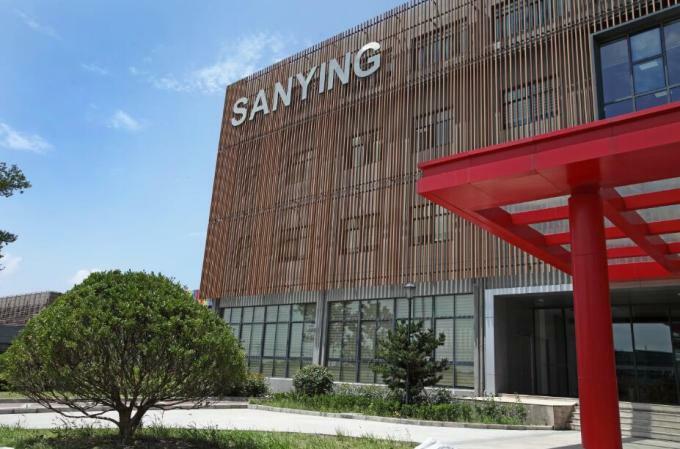 Sanying has reached over 80% of laminated pharmaceutical tubes in China. ▶ We pride ourselves on setting up a safe,green and environmentally friendly product structure and production system.We own over 100 sets of various production equipment that are set-up in accordance to GMP standards,including the establishment of blown film.We have built a 100,000-grade purification plant which houses printing,laminateing,slitting,pouch-making and tube making. Advanced production and testing equipment;Ultra-clean paltform for bacteria inspection,contaminator screener and automatic solidification room.All products are printed with benzene and butanone free ink to ensure product quality and safety. 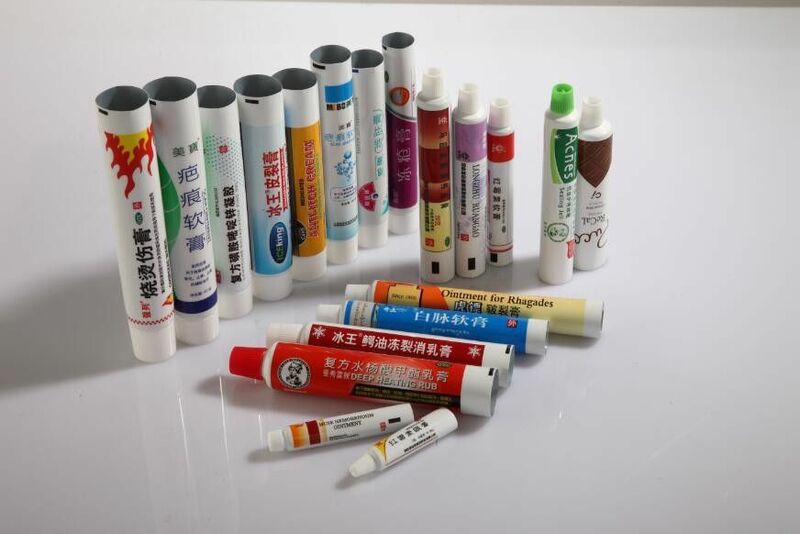 ▶ Compared with traditonal Aluminum pharmaceutical tube,our laminated tube used offset printing ensures competitive and attractive appearance. 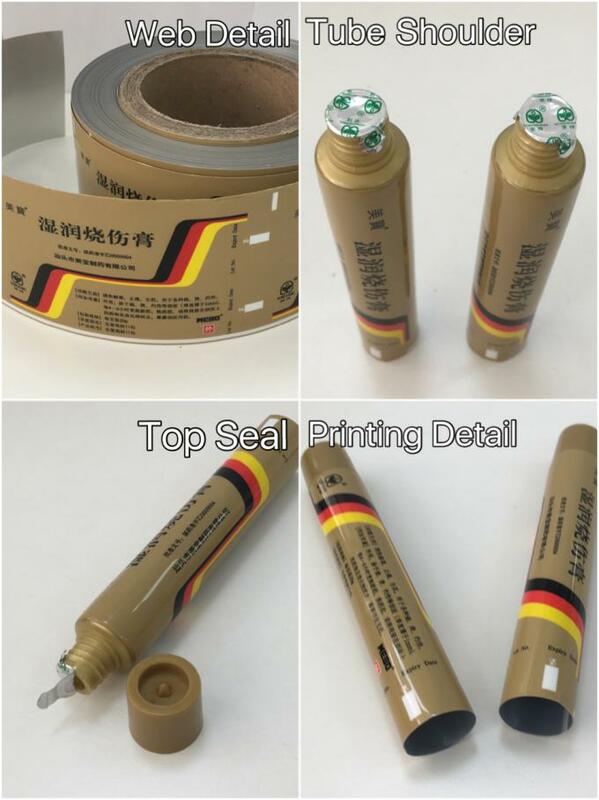 ▶ The special material (ABL275/20) is used for pharmaceutical tube.The 20μ thickness of Aluminmum foil used as a barrier.These tubes are a good barrier to gas, light, moisture, and smell, and are resistant to oil and contamination. Can be heat sealed. ▶ The private Aluminum top seal is used for pharmaceutical tube to protect content from pollution,air,sun,water.etc. ▶ The usage is for ointment, including beriberi cream, burn cream, hemorrhoids cream, eye ointment, chiblain vream, ache cream, etc.